I am coming up on my six month check-up with my medical dermatologist to see if my cancerous removed mole has in fact removed all of the cancerous portions of itself from my body. I noticed a weird and somewhat smallish mole on my lower back a few years ago. I honestly forgot about it for awhile since it was certainly not an area that I normally see, but after solicited advice from friends and loved ones that ranged from “that’s just a mole” to “um, you should probably have that thing looked at”, I decided to seek medical advice. I went in and had the whole thing removed for biopsy to be sure. Turned out it was a basal cell carcinoma – the most common type of skin cancer that usually doesn’t metastisize (spread to other parts of the body). It can however, spread to other parts of one’s skin if unchecked. I’m going in next Monday to have my dermatologist check all of my myriad freckles and moles. I am, as you know, a bit of a skincare product and makeup whore (oh, how I miss the days of college beauty routines). Like so many people I scour blogs and test things out to find the best possible products I can put on my face and body, not to mention homemade recipes with the things I can find in my own fridge. After a childhood and adolescence of sunbathing, hiking and junior lifeguarding, I have accumulated a fair amount of sun damage and I wanted to put my product whoriness to good use. I became obsessed with suncare a few years ago and while I miss my tanned limbs, I feel a bit more secure in my choices nowadays regarding sun care. For a long time I have been using Vivite SPF 30 ($22). It’s pretty awesome as a daytime moisturizer/sunscreen. It has glycolic acid in it, which is fantastic for sloughing off dead skin, but I’ve had some IPL treatments which forbid the use of any retinoids or glycolic acid for awhile before and after treatment. I’ve come to rely on Elta MD SPF 30 ($25) as my go-to sunscreen now. It’s light and feels kind of amazing (I have oily skin so I hate heavy products). For days when I know I am going to be in the sun, I use Solar Protection Formula SPF 58 ($21). The downside is that the zinc in it makes you look kind of sickly, but it is awesome at protection from the sun (don’t use if you have a day date). If you already have some sun damage, I highly recommend using some Niacin products. Nia24 is the best on the market that I have found for reducing sun damage. Their exfoliant cream cleanser is amazing as is their night damage cream. A lot of sunblock and sunscreens can be good for sun protection but bad for your skin’s well-being. 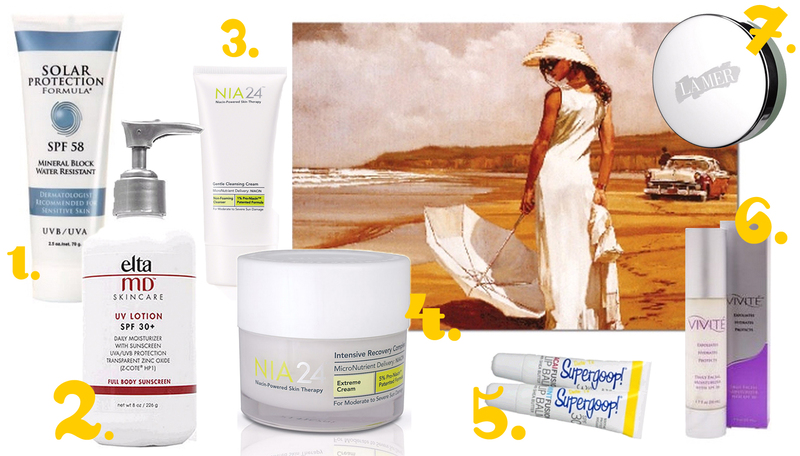 So many products on the market focus solely on sun screens but can be super-harsh for your skin. After reading a post on IntoTheGloss.com (I love that site). I discovered the best database for figuring out protection factor versus skin-harmfulness: EWG.org. If you have any doubt, check out the products you want to use on that site. So brilliant. The lips are often a neglected area when it comes to sunscreen, but I really love Dr. T’s Supergoop ($8.50). I like La Mer’s Lip Balm ($50) at night, but honestly I use Vaseline more. During the day, you really cannot find a better product for lips than the SPF 30 of Dr. T’s Supergoop (I like acai better than mint) . This stuff has saved me from insufferable California sunshine so many times (it’s only insufferable when hazy, but I do miss seasons). I had a large freckle on my lip a few years ago that has since gone away after using protective lip balms/glosses. Protect your lips. Another note for you: apply that sunscreen to your neck, decolletage and hands. A simple homemaking tip is to get a lovely lotion jar and fill it with half lotion/half sunscreen. There are some awesome apothecary jars out there for just such an occasion. Find or make them, but regardless and whatever your age, protect and then do it again. Sunscreen wears off after four hours (every sunscreen does) so reapply and know that it is just a thing you have to do. If you have questions, ask and I am more than happy to help out.